The Maltz Museum of Jewish Heritage, in partnership with Roots of American Music (ROAM) and Rock and Roll Hall of Fame, celebrated the voices of young people standing up to bias and bigotry through the annual Stop the Hate® Youth Sing Out contest held earlier this month. This is the first of three Stop the Hate events that will occur in the 2018/19 school year. 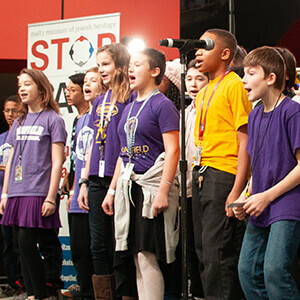 An estimated 1,000+ students from 18 middle school classes and 27 high school classes representing 16 different schools will participate this year, to pen and perform songs for Stop the Hate® Youth Sing Out. This annual program sharpens written and oral language skills while fostering a deeper understanding of historic human rights events as an arts-integrated learning initiative. Students visit the Maltz Museum of Jewish Heritage for a Stop the Hate tour. They reflect on what they’ve learned, consider bias they’ve experienced in their own lives, and discuss how to use their voice to be an upstander. Students then return to their classrooms where they partner with a ROAM musician who works with them to write an original song. The songs are performed in front of a panel of judges at the Rock and Roll Hall of Fame, where students also learn about the power of music in protest. Winners are invited to perform their original songs in front of approximately 500 audience members during the Stop the Hate® Youth Sing Out award ceremony. Students competing in the “sing out” song writing competition are vying to win anti-bas education grants for their schools where as students competing in the “speak out” essay contest are vying for much more. Each year, the Maltz Museum of Jewish Heritage gives out $100,000 in scholarships and anti-bias education grants in recognition of 6-12th grade upstanders in Ashtabula, Cuyahoga, Geauga, Lake, Lorain, Mahoning, Medina, Portage, Stark, Summit, Trumbull and Wayne counties. Included in this number is the grand prize of a $40,000 scholarship for one junior or senior who wins the essay writing contest. The contest enters its second decade this year, and it is as timely as ever. Maltz Museum board member Darrell McNair, President/CEO of MVP Plastics Corporation, was named the new Stop the Hate Chair and Scott Simon, President of North Pointe Realty, was named Vice Chair. If young people are looking for a way to express their own experiences with intolerance and speak out about what they have done or want to do to stop the hate, the Maltz Museum encourages them to participate in the Stop the Hate® Youth Sing Out essay writing contest. The contest is open and is now accepting entries. Deadlines are for Grades 6-10, ESSAYS DUE: Wednesday, January 9, 2019; 11:59pm and for Grades 11 & 12 ESSAYS DUE: Wednesday, January 16, 2019; 11:59pm.